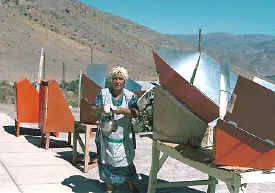 The following is based on a report by Louise Meyer, honorary SCI advisor and partner in Solar Household Energy, Inc.
Anne Marie Wenger-Marti, a member of Group ULOG in Switzerland, has spent each August since 1990 teaching solar cooking to university graduates living in communities southwest of Alexandria. 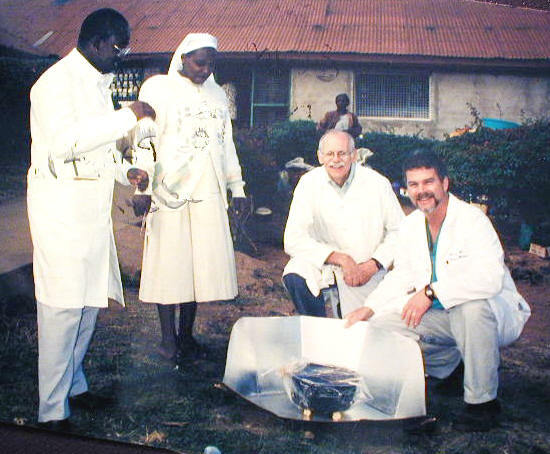 (See the December 2000 and April 2001 issues of the Solar Cooker Review for details.) In Sept. 2001 I visited El Hammam, one of those communities, and was accompanied by Swiss Red Cross employee Dr. Denham Pole. We were welcomed by nine newly trained solar cooks and were able to interview them with the help of a translator. We discovered that Egyptian beans and wheat berries, two common foods, cook faster in the ULOG cooker than on gas. We were also told that the list of women waiting to be trained in solar cooking continues to expand and that many men have also requested the training. This group of new solar cooks had to wait three years to go through the training and purchase a solar cooker. After the interviews, we visited the homes of three solar cooks and inspected their ULOG solar box cookers. Along the way we were treated to a delicious solar-cooked meal prepared by all the cooks. The feast consisted of sweet potatoes, zucchini and tomatoes, chicken, rice, corn bread, white potatoes and onions, wheat berries in sweetened milk, and cake. On my first visit to the area back in July of 2000, I was amazed to learn that these women had each purchased their ULOG solar box cookers, even though they owned fully equipped homes! They explained that they prefer solar cooking to gas cooking because it frees up time and the food tastes better! We were told that they used their cookers daily and that nearly all Egyptian recipes are adaptable to solar cooking. Bill, Connie, Zach and Taylor Young, along with Marc and Michelle Reynolds, recently completed a medical mission project at a rural hospital in eastern Kenya. As part of the project, they introduced SCI’s CooKit to patients and their families. SCI member Ruth Dettinger sent word of a solar cooker designed by her husband, Glenn, for a Peace Corps volunteer headed to Niger. The cooker needed to be lightweight and compact enough to fit in a small suitcase. Mr. Dettinger’s final design, made with wires and emergency blanket reflective material, weighed in at 8oz and folds up accordion style. The cooker is constructed of six wire panels, covered with reflective material and sewn together in a circular fashion, that each measure 17 inches high, 21 inches wide at the top and 9 inches wide at the bottom. The panels are sloped at 45 degrees. The cooker is designed to sit on a base made of a large, forked tree branch extending at least two feet from the middle of the cooker base, and two or more smaller branches that are tied upon it extending far enough outwards in both directions that the cooker can rest upon all the branches. This base can be covered with a woven mat and additional reflective material if desired. The cooking pot would then rest upon the branches or mat. The cooker may be tilted up to 15 degrees. To achieve appropriate cooking temperatures, pots used in this cooker need to be covered with a transparent plastic bag that allows sunlight in and keeps heat from escaping. The Dettingers recommend making a wire frame, like those discussed in previous issues of the Solar Cooker Review, to hold the bag in proper shape so that it can be set over the cooking pot. This allows easy access to the pot, and makes it possible to use common, non-heat resistant plastic bags without them touching the pot and melting. The Association for the Popularization of Solar Energy for Domestic and Industrial Use recently hosted a successful national conference on solar cooking, solar drying and household lighting. The organization is currently developing a solar energy village where simple solar technologies, including solar cookers and dryers, will be manufactured. Contact: Dr. Rose Achunine, c/o Dr. Mrs. R.N. Achunine, College of Education, Imo State University, P.M.B. 2000, Owerri, Nigeria. The German NGO Green Ocean plans to conduct solar cooking workshops in schools in a coastal village on the island of Zanzibar, as well as facilitate the production of solar parabolic, box, and panel cookers. Funding is currently being sought to ensure that the project can continue. Sunny Miller, an active member of the Solar Cooking Interest Group, has been invited to present solar cooking to a seminar at Murdoch University entitled “Women Leaders on Uptake of Renewable Energy Technologies.” The seminar, hosted by the Australian CRC for Renewable Energy and the United Nations Environmental Programme, aims to familiarize delegates from local governments, schools, and NGOs, with technologies for development in tropical and sub-tropical regions of the developing world. Dr. Mahnaz Saremi, former SCI Project Director, presented a seminar at the University of Bou-Ali Sina in Hamadan on the role of local women in dissemination of solar cookers in eastern Africa. She also demonstrated solar cooking to members of an environmental NGO in Shiraz and donated a CooKit for further use and study of its feasibility for dissemination in the area. An article written by Dr. Saremi titled “Appropriate Technology, NGOs and Sustainable Development, Case Study: Solar Cooking in East Africa” will soon be published in the Journal of Agriculture and Industry in Iran. Contact: Dr. Mahnaz Saremi, 7624 Amber Way, Stockton, California 95207, USA. In 2001, more than 3,000 additional families received CooKits, training and follow-up services through SCI’s projects in Kenya, Ethiopia and Zimbabwe. SCI also made substantial improvements in its ability to assist greater numbers of organizations and communities in future solar cooking endeavors. 2,300 families in Kakuma, Kenya, received CooKits and training in their use this past year. SCI initiated a smaller, more targeted group project within the camp to provide increased support in the form of home visits, extra training and additional equipment. As part of that project, SCI is training families to use solar cookers in conjunction with Water Pasteurization Indicators (WAPIs) to ensure that they have safe drinking water. The appointment of Virginia Ruguru as Project Officer provides for closer supervision of the Kakuma projects and better cooperation with partners as SCI prepares for eventual turnover of the project. Solar cookers are crucial tools used by many camp residents to cope with increased food and fuel wood rationing. Trainers often hear this message from refugees while conducting home visits. SCI’s efforts to systematically document fuel wood and food savings resulting from solar cooker use provide the evidence that inspires partner organizations to offer additional support. Camp walkthroughs often show solar cooker usage rates exceeding 50 percent. Due to recent floods, more than 1,000 homes were destroyed, along with the CooKits within them. SCI is currently seeking special financial support for replacement of these CooKits. Five hundred CooKits — the first produced in Ethiopia — were distributed as replacements or supplemental cookers this past year. Solar cookers are so appreciated that many refugees willingly paid small sums of hard-earned money to obtain replacements. Prior to this year, SCI relied on an often undependable importation process to get cookers and plastic bags to the camp. Selam Technical School is now making CooKits locally, and SCI will work with them in the coming months to produce a quality product. Access to local supplies will be increasingly important as SCI prepares to phase out of the camp, where the United Nations High Commissioner for Refugees (UNHCR) plans to begin a period of voluntary repatriation of refugees to Somalia. SCI is coordinating schedules with UNHCR to ensure that families have the skills necessary to take solar cooking with them wherever they go. A comprehensive evaluation of the Aisha project was completed in November, 2001 in cooperation with UNHCR. Once processed, this data will provide valuable information that will guide SCI’s future work in teaching solar cooking skills to people in need. More than 1,000 CooKits were distributed in Zimbabwe last year through SCI’s partner, the Development Technology Centre of the University of Zimbabwe. Adding urban communities in Harare to the rural outlying areas already served has led to increased CooKit sales and greater benefits for the solar cooking teachers/sellers. As more people learn how solar cooking reduces fuel costs and frees cooks to spend more time doing other activities, sales of solar cookers will likely continue to increase. The addition of a new, charismatic staff member to the project, Florence Shangwa, and a stronger emphasis on working with experienced businesswomen and church networks has contributed largely to rejuvenating the project. These accomplishments are impressive, especially in light of the challenging conditions in Zimbabwe under which the project is implemented. Social, political and economic influences hinder project implementation activities through curfews, fuel rationing, political violence and restrictions on meetings. For SCI, the Zimbabwe experience is different in that a) it occurs in regular community settings rather than in a refugee camp, b) SCI is providing technical support to a partner that in turn implements the project and c) solar cooks pay full price for the CooKit and bags. Consequently, it is a rich learning opportunity that provides valuable information and insight as the organization plans for future projects in similar communities. SCI is bringing innovative water testing and solar water pasteurization methods to Tanzania in collaboration with AHEAD, a US-based nonprofit organization. Dr. Bob Metcalf, SCI founder and microbiologist, continues to lead this research and teaching program. Over the past year, SCI has provided technical support and guidance to individuals and organizations in countries including Nigeria, Madagascar and Turkey, and SCI has helped to create new links between those requesting assistance and skilled individuals and organizations that can provide helpful services. Additionally, the SCI board of directors, working with other refugee service organizations, has formed a task force to explore a possible solar cooker program for the neediest populations in Afghanistan. The actions listed above take place in the context of accelerating loss of forests and diminishing water quality worldwide, resulting in illnesses and increased fuel wood collection burdens for women and their families in many developing countries. So SCI will continue with its vital day-to-day activities, while bolstering its capacity to yield greater benefits in the years ahead. SCI has recruited additional program staff, especially in eastern Africa, and is providing them with training and tools to increase their effectiveness. SCI is also gathering more and better information about the solar cooking learning/teaching process and continues to explore ways of making this information useful and readily accessible. Perhaps most exciting is the imminent expansion of SCI’s eastern Africa regional office into a resource center for solar cooking and solar water pasteurization. The center will further the transfer of solar cooking knowledge to the regions and countries most in need. The center, which SCI hopes to eventually replicate in other parts of the world, will pool local expertise and resources with methods, approaches and cookers that are tuned to the unique characteristics of the region. It will improve SCI’s project management and technical support capacity, and address its other program goal areas of education, research, advocacy and information exchange. High solar cooking usage rates, invaluable information gained through project evaluations, and the strength being built into the new eastern Africa resource center will combine to encourage more organizations to join in spreading life-sustaining solar cooking skills. Meanwhile, SCI will initiate a new project in a non-refugee community setting in Kenya during the next year, creating an important model for other organizations to emulate. SCI strives to be a catalyst for the spread of solar cooking — multiplying the beneficial impact of solar cooking and solar water pasteurization programs through collaboration with a wide range of humanitarian and environmental organizations. SCI is accomplishing a great deal now. With your help, it will be an even more powerful force for positive change in the months and years ahead. More information about these projects is available here. While visiting the Development Technology Centre (DTC) of the University of Zimbabwe, I had the great pleasure of meeting two dynamic businesswomen, Shelly Mwanza and Maina Manunure. Both women have successfully incorporated selling CooKits into their small business ventures. While Shelly began solar cooking at the urging of her employer, Professor Melford of the University of Zimbabwe, Maina learned about the technology through Florence Shangwa, one of the champions of solar cooking at DTC. Shelly, 32, is originally from Zambia. In 1997, she moved to Harare from the residence she shares with her husband and two teenaged children in eastern Zimbabwe, to do domestic work for Prof. Melford. Shelly had tried her hand at several income generating activities, including making and selling knit goods, and hairdressing. Soon after she got a CooKit, her hair dressing clients started asking where they could get a CooKit. Shelly was inspired to add CooKits to her business and sold nearly 100 of them from March 2001 through the end of the year. She is saving the profits she makes from selling cookers so that she can buy a photovoltaic panel to operate the television, radio and lights at her home in eastern Zimbabwe. Maina has spent most of her life in Harare. She is 29, married and has a 4-year-old child. Her main source of income comes from buying dried kapenta fish in bulk, repackaging it, and selling small quantities to her clients. On occasion, she will take on some dressmaking work or sell vegetables. Maina is active in her church and much of her client base for CooKits are church contacts. She received solar cooking training from Florence in June 2001 and started selling CooKits in mid-August of the same year. As of December 2001, Maina had sold 110 CooKits, of which 8 were sold in rural areas. Maina notes that, unlike repackaging fish, selling CooKits does not require much preparation. In 2002, Maina would like to sell 2000 solar cookers, with some of those sales coming from clients in peri-urban Harare as well as small rural communities. By solar cooking at home and having outgoing, friendly personalities, Shelly and Maina are able to clearly articulate the benefits of cooking with the sun, such as the energy savings and the ease of baking breads and cooking beans. They are able to help their clients understand how to set up, use and maintain their CooKits, and to understand the differences in cooking times, amounts of water required, meal planning and food preparation between solar and non-solar cooking methods. In view of the ever-increasing cost of electricity and kerosene in Harare, Shelly and Maina will certainly benefit from a growing clientele in the months and years ahead. 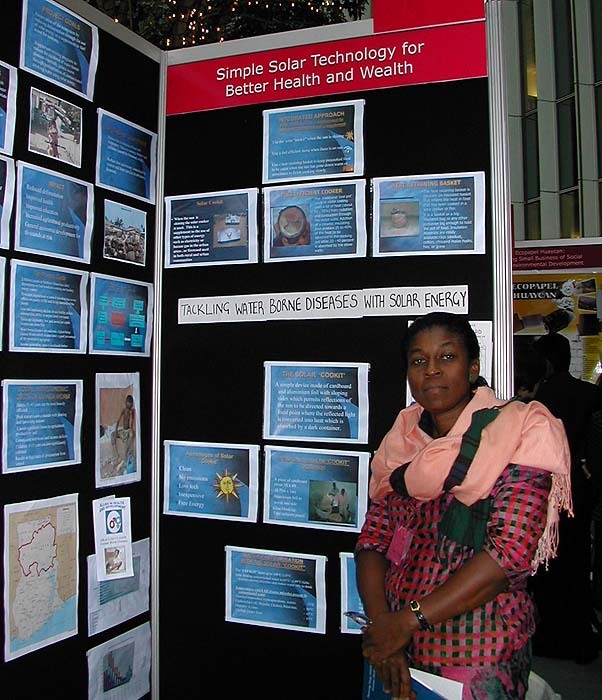 Dr. Mercy Bannerman’s project entitled “Simple Solar Technology for Better Health and Wealth” was one of only 29 proposals selected to share $4 million in funding at the Development Marketplace 2001 competition held in Washington, D.C. this past January. A total of 2,400 proposals were submitted from all over the world. The project objective is to provide solar cooking instruction and low-cost solar cookers to inhabitants of northern Ghana to reduce incidence of waterborne diseases, protect the environment, and enable women to participate in the economy. A large percentage of the funding will be used to train families to use a simple solar cooker, based on SCI’s CooKit, to pasteurize drinking water. This could greatly reduce the spread of Guinea worms, E. coli, and other pathogens. Dr. Bannerman plans to use SCI’s Water Pasteurization Indicators (WAPIs) to ensure that water is heated to appropriately high temperatures. The project also has an income generation component, whereby women will hand produce solar cookers and make them available for sale in the local marketplace. The project, which is a partnership between Allies in Health and Development and Community Partnerships in Health and Development, will receive an additional $24,000 matching grant from Rotary International through the Rotary club of Fresno, California (USA), and the Rotary club of Accra-Airport in Ghana. Solar Cookers International is making a world of difference. Your contribution will be gratefully received and used to strengthen the spread of this solar solution. If you have a choice between donating appreciated stock or cash to SCI, there are two tax advantages of donating stock. First, you receive an income tax charitable deduction for the full market value of the stock at the time it is donated. Second, you avoid paying any capital gains tax on the increase in value of the stock. You can invest in SCI and invest your cash in current stock. It’s a win-win situation! Contact Virginia Callaghan at (916) 455-4499 to discuss donations and stock transfers. Consult your financial planner for additional information. Thank you. Note: This article is reprinted by permission of its author, Casey Woods. It originally ran in the San Francisco Chronicle on July 26, 2001, with the dateline Villaseca, Chile. Shyam S. Nandwani, mentioned in the article, is a prior Solar Cookers International (SCI) board member. Pedro Serrano, also mentioned, has been an SCI honorary advisor. Lucila Rojas remembers the days when she and her neighbors risked their lives to cook a hot meal over a wood-burning stove. When the project coordinators returned after four months to take the ovens back, Rojas protested and organized local women to raise funds for a workshop to make solar ovens. With $700 they earned selling everything from empanadas (meat pastry) to used clothing, they built 33 solar ovens and have been using them ever since. With a $10,000 grant from the United Nations Development Programme, 26 Villaseca families formed an organization called the Association of Solar Artisans of Villaseca, which now runs the aptly named Restaurant Solar. Although the restaurant opened only 11 months ago and diners must travel over a bumpy dirt road to its hillside location, it is already a landmark. On weekends, about 60 customers a day come to savor its specialties: fresh bread; cazuela, a meat stew; and leche asada, or flan, for dessert. It takes two hours to bake bread and about three hours to cook stew. Sometimes, groups of as many as 40 people are turned away since the restaurant seats only 24 diners at a time. Its organic garden can’t keep up with the demand. The majority of patrons are foreign tourists on package tours. Since 1996 Rosalyn Rappaport has worked closely with the 20 women who comprise the Marakissa Solar Cooks Club, helping them to acquire solar cooking knowledge and equipment. On her most recent trip to Gambia she provided further assistance to the club and helped develop a system of solar cooking dissemination in nearby communities through demonstrations and curriculum. During a prior visit, Ms. Rappaport worked with a local carpenter, Momodu Sillah, to design and construct a wooden panel cooker similar to SCI’s cardboard CooKit. This cooker, which weighs 2 kg and costs D450 (US $25), consists of several removable, hinged panels held together by an adjustable loop and string system that allows the entire cooker to be disassembled quickly and easily transported. This is important given that many Gambians are farmers and would have trouble transporting a large, heavy solar cooker with them when they work in the fields. With support from the Julius Silman Charitable Trust, members of the Solar Cooks Club will each receive their own panel cooker. They previously shared two box cookers — one that went with the group when they worked in the fields, and one that rotated from household to household on a weekly basis. Club members had noticed increased interest from their neighbors over the last couple of years, leading Ms. Rappaport to believe that this is the appropriate time to begin to spread solar cooking knowledge to those outside the club. As a first step, four club members will be selected to become solar cooking instructors, who will then earn a stipend to conduct demonstrations in surrounding villages. A solar cooker can be left with each village at the discretion of the instructor. Ms. Rappaport has discussed with school administrators the possibility of incorporating solar cooking into the curriculum of the St. Martha Skillcentre, a school that teaches housekeeping and business skills to girls and young women. After some minor roadblocks, it looks as though this may happen very soon. Ms. Rappaport hopes to work with other local NGOs in the future, including the Renewable Energy Agency and a local mosque. She also is working hard to gain television coverage for solar-cooked village feasts hosted by the Solar Cooks Club. Contact: Rosalyn Rappaport, 31 Lodge Lane, North Finchley, London N12 8JG, England. Tel: 0208 446 3690. As volunteers with Alfalit International, Inc., we teach nutrition, gardening and solar cooking throughout Latin America. Alfalit is an interdenominational program in 22 countries, mostly in Latin America, working for 40 years to combat illiteracy and to improve the integral development of individuals, families and communities. Other programs focus on basic education, preschool and community development. Since our retirement 3 1/2 years ago, my husband Chuck and I have taught in homes, schools and preschools, prisons, churches, hospitals, health clinics, universities, community centers and dining centers, in the following countries: Peru, Venezuela, Bolivia, Costa Rica, Nicaragua, Panama, Guatemala, Mexico, the Dominican Republic and Haiti. Indigenous people in Panama were amazed and excited to taste the green plantains we cooked in a simple solar cooker. Eager to avoid walking 2 hours to collect firewood — often with their small children — and to avoid constant wood smoke in their lungs and eyes, they made their own solar cookers from cardboard boxes, glue and aluminum foil. They quickly learned how to cook a delicious local recipe using plantain skins. Just months before the disastrous December 1999 floods in Venezuela, where 25,000-50,000 people drowned, we had taught solar cooking in several areas. In a part of Nicaragua still suffering from Hurricane Mitch, almost nobody came to our announced solar cooker program -- until some curious passersby noticed foods cooking in the solar cooker. As we demonstrated the cooker, more and more folks gathered, ready to learn more about both solar cooking and ways to feed their families better with very limited resources and still-limited foods. Some others had relied on solar cookers after the hurricane. Haiti has a special need for solar cookers. Most of Haiti is deforested, and therefore eroded, arid, and much hotter than before the trees were cut. Much of the country is now, literally, a desert. In several countries, even in cities, many quickly grasp the value of solar cookers to pasteurize water and to cook because people are very concerned about fuel shortages and rising prices of cooking gas. Often, no gas is available at any price. One Mexican family bathed their new baby in water heated in their solar cooker. We have taught approximately 2100 persons in 11 countries to make and use solar cookers and have demonstrated and explained their use to several thousand more. Our purpose is to teach those who will teach others. Usually we do not return to the same places. We recognize that systematic follow-up is essential to adoption of solar cooking. However, because Alfalit works mostly with volunteers, with major emphasis in literacy and basic education, there is little specific follow-up related to solar cooking. Result: more people are taught to make and use cookers and teach others, but with limited follow-up. Return visits by Alfalit staff and others indicate some continued use of solar cookers. We have observed much interest in solar cooking, but sustaining it is a challenge. Overall, we have found that increased use of gardens and solar cooking contribute significantly to improved nutrition and health. SCI notes with sadness the untimely passing of one of its founders, Margaret Payne. Margaret served as Assistant Dean at the University College at the University of the Pacific and had been recently honored for her tireless work inspiring countless older and re-entry students to complete their degrees. SCI is grateful for her generous support through the years. We extend deepest sympathy to her family. This wheat-, yeast-, and dairy-free recipe comes from the Summer 2001 edition of The Solar Collector, newsletter of the Solar Cooking Interest Group (Australia). Thanks to Tin of Fremantle, Australia, for the submission. Sift first five ingredients. Add seeds. Mix honey and milk together, and stir in the dry ingredients. Pour into a lightly-greased baking pan. Bake in a solar cooker at midday for 2 hours or until bread comes away from the sides of the pan and is nicely browned on top. According to a recent press release, the Overseas Private Investment Corporation (OPIC) is contributing a $300,000 loan to a joint venture that will provide solar cookers to low- and middle-income households in Uganda. Sun Ovens International, Inc. of Elburn, Illinois, USA, through the USAID Global Technology Network’s business facilitation program, has licensed their GLOBAL SUN OVEN® solar cooker to a joint venture between UltraTec of Kampala, Uganda and the Tucson Transatlantic Trade Inc. Holding Group (TTT). TTT is active in the energy, environment, factory automation, industrial construction and food processing sectors, with activities in the Americas, Europe, Africa and Asia Pacific. This transaction is supported by a $100,000 grant from the U.S. Department of Energy, in addition to the OPIC loan. Initially, 60 units have been shipped from the U.S. for test marketing. Local assembly and manufacture will follow as the market grows. After the initial test marketing, sales forecasts will be developed and a component part manufacturing facility will be opened in the TTT Inc. Holding Group Industrial Park near Kampala, Uganda. This local production capability should directly translate into an approximate cost savings of 40 percent, thus making the units more affordable. The National Strategy for the Advancement of Rural Women in Uganda (NSARWU), an NGO founded by the First Lady of Uganda Janet Museveni, will assist in making the ovens available to women in rural Uganda. NSARWA is developing a culturally appropriate training program that will distribute ovens to trained participants allowing them to make small monthly payments, over a three-year period, from the savings obtained by not purchasing other cooking fuels. I was introduced to the world of solar cooking in 1982 when, as a student, I was working on a heat-transfer experiment at the Brace Research Institute in Montreal. Brace had shortly before that experimented with and tested a variety of solar cookers. Many years had passed by for me without any further solar cooking exposure until I discovered Solar Cookers International’s web site three years ago. The site has since become the place where I catch up on solar cooking activities. The “CooKit” is one of my favorite solar cookers. After reading about difficulties many people face locating heat-resistant bags, and experiencing how ordinary plastic bags melt on contact with hot cooking pots, I started to explore the possibility of a simple, low cost, easy to construct cooker that requires no plastic bag. I have designed one that I call Double-Angled-Twelve-Sided (DATS) solar cooker. It seems to do the job on clear, sunny days. DATS cooker employs 24 small reflective panels to concentrate extra sunlight to compensate for the heat loss from not using a plastic bag. DATS cooker design is similar to a deep-focus parabolic cooker, but instead of using a true parabolic curve, multiple flat panels concentrate sunlight onto the cooking pot. Two reflective surface-angles, 45º and 60º, are used so that a bend can be introduced in between for structural rigidity to hold the cooker’s shape. This structural rigidity allows for DATS cooker to be constructed out of cardboard material. A DATS cooker, tested in Shanghai, reached a maximum temperature of 140ºC (284ºF) inside an empty black cooking pot, on a clear sunny day with 21ºC (70ºF) ambient air temperature and a slight breeze. Eggs became hard-boiled in 30 minutes and two cups of rice cooked in 95 minutes. The cooker should be re-positioned every 45 minutes or less for better efficiency. A simple supporting structure, made out of bamboo or wooden sticks, is built-in as an integral part of DATS cooker to support the cooking pot at the desired cooking position. DATS cooker is held rigid by a string, which links all twelve 45º-panels together at the bottom end. The string is made taut by twisting in the loose string loop around a short stick. The tighter the string is, the better DATS cooker holds its shape. If needed, a small gage string, tied across two opposite panels, at 3:00 o’clock and 9:00 o’clock position, can be used to pull in any slack in the cooker shape due to gravity. By loosening the string and removing the cooking pot supporting structure, DATS cooker can be folded up for storage or transportation. Required materials are cardboard, aluminum foil, white glue, paper tape, small bamboo/wooden sticks, and string. Cut 12 rectangular pieces of cardboard measuring 24cm x 61cm each. Trace and cut the following shape on each cardboard panel. Make a straight fold at 24cm distance from the small end of the panel. Punch a hole in each of the two “ears” at the narrow end of the panel, as shown, and fold the ears away from you. Place the panels side by side, along the longest edge of each panel, and tape them together until all 12 panels are joined to form a ring. Glue aluminum foil on all inside surfaces of the cooker. Pass a string through the punched ear holes at the lower end of the cooker, to join the lower panels together. Twist the loose string loop around a short stick, to pick up the slack in the string and form a rigid, deep parabolic sort of shape. For added efficiency, cover the round opening at the bottom of the cooker with a reflective disk. To construct the pot support, puncture a small hole in the middle of the lower half of four of panels. Push two 35cm-long bamboo/wood sticks, in parallel, through the four holes, to form a pair of support rails for the cooking pot. Small pieces of cardboard are then glued on the outside, along the bottom of the two protruding sticks, for additional rail support. Tie the exposed stick ends on the outside with rubber bands to prevent the sticks from sliding. Attach two 29cm-long bamboo/wood sticks, perpendicular to the rails, and sandwich the bottom end of the sticks between the lower panel folded ears. Connect the two perpendicular junctions of the rails/sticks with a wire or string for added pot stability, allowing pot loads of up to 2.5kg. The DATS cooker is now ready for use. Position the cooker to face the sun directly. A black pot, with food inside, can now be either placed flat or angled on the support rails to be cooked by the heat generated from the reflected sunlight. 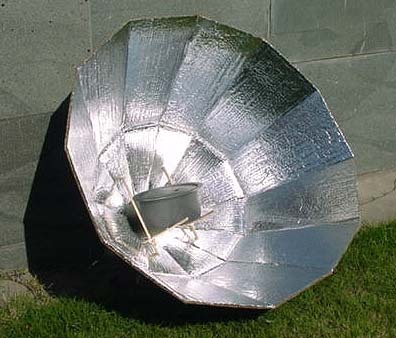 Solar Cooker Review is published two or three times per year, with the purpose of presenting solar cooking information from around the world. Topics include solar cooker technology, dissemination strategies, educational materials, and cultural and social adaptations. From time to time we cover related topics such as women's issues, wood shortages, health, nutrition, air pollution, climatic changes, and the environment. Solar Cooker Review is sent to those who contribute money, or news about solar cooking projects. The suggested subscription price is US $10/year. Single copies are sent free to select libraries and groups overseas. SCI is a 501(c)(3) nonprofit organization assisting communities to use the power of the sun to cook food and pasteurize water for the benefit of people and environments. We do not sell, rent or trade names of our donors. Tax ID # 68-0153141. SCI’s mission is to spread solar cooking to benefit people and environments.